Students of Greek mythology will recognize the tragedy that surrounds the words that Cassandra speaks. 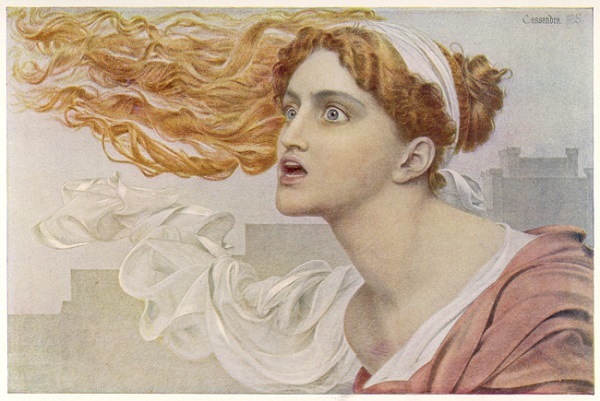 Cassandra of Troy, was a daughter of King Priam and Queen Hecuba in Greek methodology. Attracted by her breathtaking beauty, Apollo gave her the power of prophecy and foretelling the future in an attempt to seduce her. Strong willed and defiant at times, Cassandra rejected Apollo. As the story goes, Apollo spat in her mouth triggering a curse that no one would ever believe her prophecies. Sadly today, the yield curve (or the spread between the 10-year note and 3-month note yield) has become a modern day Cassandra. An inversion of the yield curve is the best predictor of recession for the last 50 years. It has inverted before every single recession with no false positives. An inverted yield curve means that the long-term Treasuries have a lower yield than short-term debt instruments. Yet, economists and even Fed officials are questioning the predictive power of the yield curve. They are falling into the dangerous trap of not listening to Cassandra. This has happened before. In 2006, prior to the global financial crisis, the yield curve inverted. At that time, former Fed chairman Ben Bernanke argued the inverted yield curve may no longer be a strong recession indicator since bond markets have become global. Well, the rest is history as the Great Recession soon followed. Just as Apollo became lost in Cassandra's beauty, Wall Street veterans have become entranced with the ever-growing U.S. economy. What could go wrong? Recession? No way, they say. Don't forget this juiced-up late stage expansion is fueled by one of the largest corporate tax cuts in history. The $1.8 trillion fiscal stimulus package passed last year is working. Here's the rub. It only lasts so long. Congress can't pass another tax cut next year and the economy will begin to run out of gas. The yield curve hasn't inverted yet. But, it is flattening noticeably. The 10-year note yield at 2.9% is still above the 3-month bill yield at 2.1%. But, it's getting close. As the Federal Reserve continues to hike interest rates, the inversion will become closer and closer. This is a foolproof recession predictor. In July 2000, the yield curve inverted. Not long after, the business cycle peaked, the Dot.Com stock market crash came and the recession started in March 2001. Then, the yield curve inverted in August 2006, and the Global Financial Crisis sparked a recession that began in December 2007. It has inverted before every recession back to 1953, when the data started. It's time to listen to Cassandra. The yield curve is warning that the next recession is on the horizon, no matter how rosy the economy looks right now. The S&P 500 lost roughly 50% of its value in the 2007-2009 bear market. Yes, 50%! If you haven't fully diversified your portfolio with tangible assets, the yield curve is warning that you should act now. Physical gold bullion typically surges sharply higher when stocks crash. Owning physical gold is a simple strategy to protect your assets in the coming recession. Don't make the mistake of discounting Cassandra's warning. Ignore her at your own peril.